Recently I was approached by MoneySupermarket.com to see if I wanted to take part in their Room for improvement challenge. The idea is quite simple they were offering the most creative bloggers in the UK £50 to spend on improving a room of their choice within their home. The project was to showcase how creative we are as a nation when working on a tight budget. I had initially wanted to do my bathroom (desperate for a face lift) but due to the deadline plumped instead for adding some finishing touches to my bedroom. 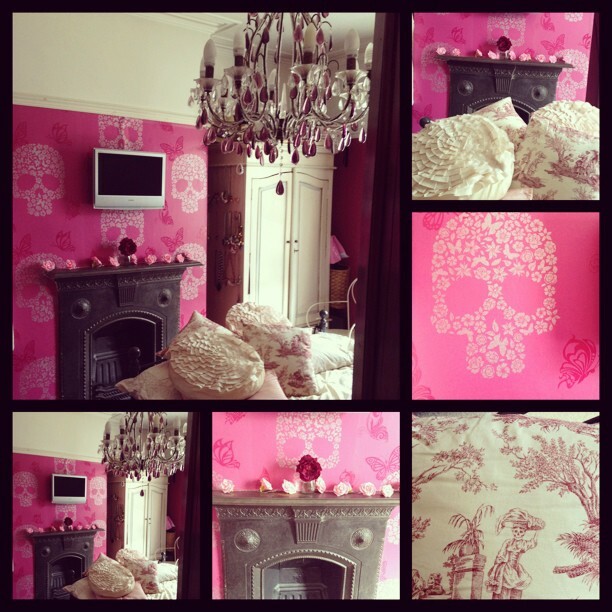 I actually decorated my bedroom a few years ago and absolutely love the colour which is a dark pinky red but I have for a while felt it needed a little extra something to make it look more luxurious. Using my moneysupermarket windfall I decided to wallpaper the chimney breast which has a beautiful cast iron fireplace on it and create a feature wall. I warn you now this wall also holds the TV which I know isn't very trendy but hey I don't live in a interiors mag this is my bedroom and I like to watch telly in bed. 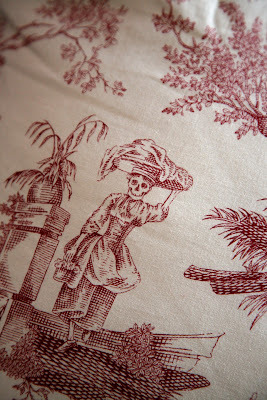 Ive been lusting over the skull wallpaper designed by Meg Mathews for Liberty for years but its just totally out of my price range at £89 per meter (and you can longer get the pink version anyway) The idea has niggled at me regardless and nothing else except pink skull wallpaper would do. 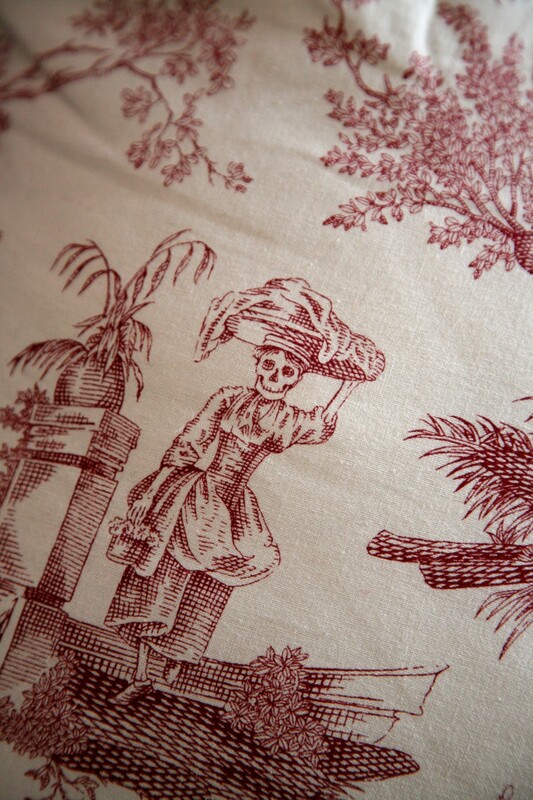 So I was very chuffed to find some skull wallpaper with the a butterfly motif on from ebay for £14 a roll. I was a little bit worried about what the quality would be like but its fine and was quite easy to hang (according to my husband, I supervised this part of the project by making tea) I love the contrast of such a girly colour with the rock n roll of skulls-part sweet, part edgy. 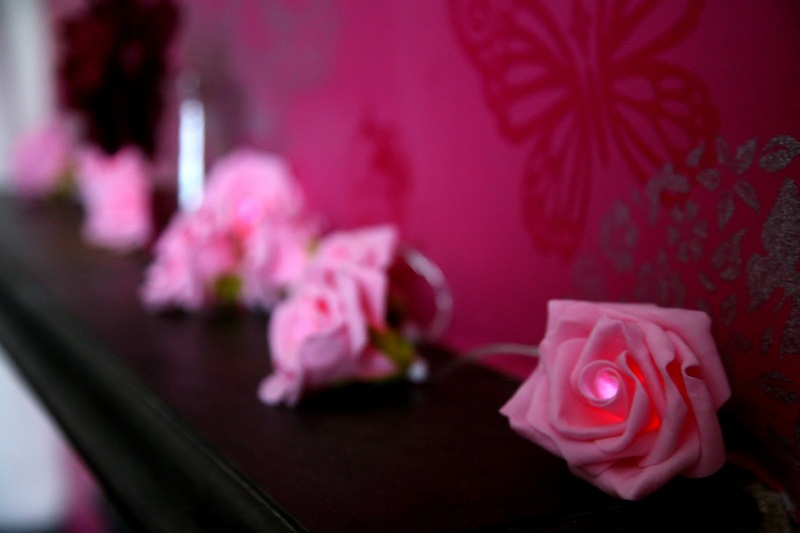 Ive also long wanted some fairylights to put on the fireplace as I love twinkly lights after dark and found some beautiful wedding ones for £14 from Fabulicous.com They are pink roses, quite big and on the cast iron fireplace slightly Miss Havisham. This left £6 for wallpaper paste, a cutting knife and batteries for the fairy lights and I hit dead on £50. You can see what other bloggers did with their £50 over on the Room for Improvement Twitter feed. Its really inspiring.